Fracking Capitalism exposes the cowboy economics that underpin the fracking industry in Britain. Thanks to the authors, people can finally know the real truth behind the Coalition government’s controversial policy. Editor Paul Feldman poses a question in the introduction to help the reader to ponder about the suitability of existing government structures to slow, and then halt global warming. As Fracking Capitalism further exposes, there is a clear conflict of interest in the issue, which makes any hope of the Coalition government, or any government for that matter, addressing these pressing issues unrealistic. It is very revealing that a respected economist like Lord Stern dismisses the view of the government that shale gas production will bring down energy bills in the UK, as “baseless economics”. Consultants further cast doubt on the second reason that has been given for supporting the fracking industry, that many jobs will be created. The book shows that the ratio of energy gain to energy used has been greatly exaggerated. Even the British Geological Survey (BGS)’s figures of the potential shale gas reserves have been misrepresented. The risks that shale gas extraction poses to the local communities and the environment at large are clear, but the Coalition government is keen to go ahead with its plans nonetheless. Why is that the case? This well-structured book throws this question to the reader, then it breaks down the subject to show the reader that capitalist forces are at play. As the authors show, the profit motive of corporations, and the fact that political institutions depends on these unethical entities for its survival makes the socioeconomic institutions unfit for the 21st century. To make the economy something that works for everybody, while at the same time being environmentally friendly and sustainable is just unworkable under the current paradigm. 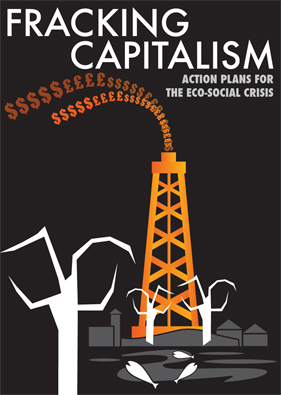 On top of highlighting the dangers that our elected politicians are leading us towards, Fracking Capitalism does well to propose an alternative, well thought-out and workable action plan. But a plan that acknowledges that capitalism is the problem, and the economy should be run on a not-for-profit basis is likely to be seen by the status quo as hostile, and opposed at every level. However, even the unethical and profit-driven corporations depend on the masses for their survival. The politicians get their legitimacy from the masses too, so when the working people at the bottom of the economic hierarchy realise just how much power they have, they can put an end to this corrupt system overnight. Penny Cole and the writing team have shown that Cuadrilla and the other fracking companies can be stopped from fracking your neighbourhood, and that the people can collectively frack capitalism instead.